Online dating: risks and how to avoid them | What's up @ Skawa? 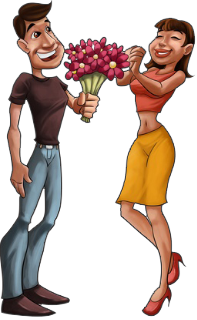 Did you know that the third week of September is National Singles Week in the U.S.? On this upcoming occasion, we have collected a few statistics and data on online dating. So much about the popularity of these services. Concerning the proportion of successful relationships that begun on online dating portals, statistics show that 33 per cent of online daters form a relationship, 33 per cent do not, and 33 per cent give up before finding “the real one”. There a lot of tricks and hints by which you can raise your chances. Consider, for example, that women who post a photo on Internet dating sites receive twice as many email messages as women who don’t. The same study found that men who reported incomes higher than $250,000 received 156 per cent more e-mail than those with $50,000. On the other hand, the same surveys reveal that a lot of people have serious reservations in connection with online dating. A research showed that women are afraid of meeting a serial killer, while men are afraid of meeting someone “fat”. Let’s resists the temptation of commenting on these fears and focus instead on the fact that some 3 per cent of men are psychopaths, but – how reassuring - only a tiny percentage of whom are indeed serial killers. Now, if you ask me, this is still a rather disturbing proportion. And if we add to this that on free dating sites, at least 10 per cent of new accounts are from scammers, while one in three teenagers have experienced violence in a dating relationship, we can see how important the issue of security and the ability to protect our personal data can be. But how can we get in touch with online daters if we do not want to disclose our e-mail address or telephone number? The latter can be a very common problem, as more than 80 per cent of singles still prefer conversations on the phone. On Match.com, 23 million conversations were carried out in 2011. Good news is, there is a solution for this matter. With PinkCaller, you can get in touch with online daters by the phone without disclosing your number. And this works perfectly well with mobile devices, as well. We very much hope that the biggest dating sites will soon see the significance of this development and draw on this solution to make online dating safer for all of us! This entry was posted in Other by Péter Faragó. Bookmark the permalink.